Having your own show at February's Fashion Week is a heady experience, especially if you're a relatively unknown hat designer. Eva Petty of Harlem's Heaven Hat Boutique has been making hats for 25 years, but she has never had her own show until now. "This will make my career," she beamed from the tight quarters of her hat-packed store on Adam Clayton Powell Blvd. Petty's Chapeaux are to be showcased as an up and coming designer by Antavenues Fashion Week. "I started making hats to wear to church," said the F.I.T. graduate, who majored in textiles. "The ladies at church would ask me where I got my hats and if I would make some for them". 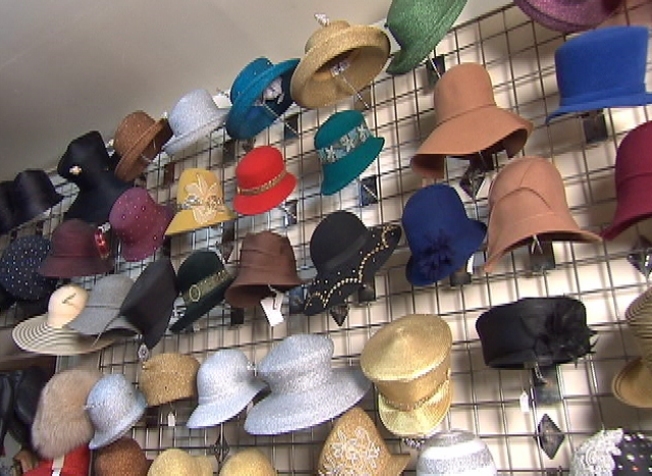 Church hats are the mainstay of Petty's business, but she has desgned also designed picture hats and other toppers for women going to the races, including the Kentucky Derby and Ascot. Prices range from around $80 dollars for a fedora to $1200 for a piece of art currently on display at the Museum of Arts and Design on Columbus Circle. Petty's hats have been used in a few magazine ads and an independent movie not yet released, so she is getting her work around the industry, but nothing like her own show. "I'll be presenting a lot of architectural shapes, images I pick up from my travels," she explained. Not bad for a woman who insists she never intended to be in the millinery business.